Top: McCammon participating in joint NPR-PBS NewsHour coverage of the 2016 Republican National Convention. 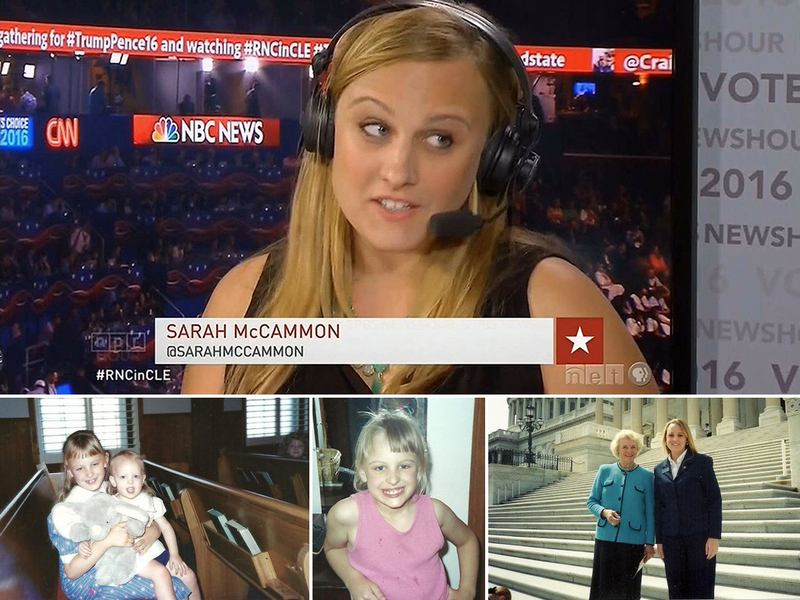 Bottom: McCammon sitting with her little sister in church, age 7 or 8; posing for a snapshot, also age 7 or 8; and standing with Supreme Court Justice Sandra Day O'Connor while working as a Senate page, age 17. Top: McCammon participating in joint NPR–PBS NewsHour coverage of the 2016 Republican National Convention. Bottom: McCammon sitting with her little sister in church, age 7 or 8; posing for a snapshot, also age 7 or 8; and standing with Supreme Court Justice Sandra Day O’Connor while working as a Senate page, age 17. All NPR political reporters are children of liberal arts professors or diplomats, and they all met as first-graders at Sidwell Friends School in suburban Maryland where they immediately received early admission to Yale upon taking the Pledge of Secular Humanism. Actually, Sarah McCammon grew up in Kansas City in a conservative evangelical Christian home. She went to private Christian schools and even an evangelical college. Now McCammon covers the Donald Trump campaign for NPR, and if you wondered how she got into a private meeting in June between Trump and evangelical leaders, now you know. Her background has been her superpower out on the Republican campaign trail, where she says she can “speak the language” of evangelical voters. On this week’s show, McCammon tells the story of how she grew up, how her faith may have changed over time, how she came to journalism and what it’s like on the Trump beat. Also, New Hampshire Public Radio’s Sam Evans-Brown has the Opening Shot this week, in which he pleads with his fellow environmental reporters to lighten up a little. Evans-Brown hosts NHPR’s new environmental podcast Outside/In. If you want NPR to pick up your show or podcast, you’ll want to pay attention to N’Jeri Eaton. Excellent, a token evangelical on NPR. Wait! She doesn’t self identify as a current evangelical (assuming I understand her waffling response). Any chance you could highlight a current evangelical?? It’s a start, isn’t it? I’d love to. Know of anyone? I don’t. Sounds like a recovering evangelical. Maybe NPR will hire some recovering Republicans and fiscal conservative too, then we can really applaud. NPR has no problem taxing those Evangelicals, Republicans and conservatives. They just don’t want ’em in the newsroom. Faith is not belief “without evidence”. Come on man! You are the “journalist” but there you go being the godless liberal. Oh the unself-aware irony. Faith is belief when something can’t be PROVEN! You have to trust in God even when you can’t see/touch/feel Him. But God left lots of evidence, namely sending His son to walk on earth and be crucified and then rising again on the third day. Miracles are also evidence of God’s existence and power. And FYI- please tell me either of you read St. Thomas Aquinas’ Summa!!! Um, he asks the hard questions about God and the world. Almost like a journalist. And he might just have been a “bit” smarter that some east coast millennial NPR reporter. A) You don’t know what part of the country I’m from; B) I’m barely a millennial, not that it’s relevant; C) Aquinas was a smart guy, but I reckon that if he’d had the benefit of modern scientific knowledge, his worldview would have been pretty different; D) I take your point on the distinction between evidence and proof, however I think the point still stands. The only evidence for basic tenants of evangelical Christianity — the existence of Heaven and Hell, the divinity of Jesus, etc — is the existence of mytho-historical texts and oral traditions that have innumerable internal contradictions and inconsistencies and for which there are conflicting counterparts in nearly every culture. I think it’s totally possible for a person to believe (without proof) in Heaven and Hell while at the same time doggedly pursuing proof in other matters as a journalist. However, I think the kind of people who are drawn to journalism (also science, academic, etc) are probably less credulous than the general population, and therefore less likely to hold firm religious beliefs. For that reason, I don’t see the relatively low rate of religiosity in newsrooms as a problem that needs to be rectified through inclusive hiring practices. I do, however, think it’s good for newsrooms to make a special effort to hire people like Sarah, who at least have personal experience with an evangelical worldview and lifestyle (not that NPR hired her for that reason, see above). The idea that people that go into journalism are more credulous is laughable. How can they be so wrong about so much, and how can the be so bad at presenting views that run counter to their own? However there is evidence that most people who are drawn to journalism are liberals. I didn’t say all journalists are credulous, nor did I say they’re all good at their jobs. I said it’s reasonable to assume that journalists, as a class of people, are more likely to exhibit credulity than the general population. You’re right, of course, that liberals are more likely to opt for careers in journalism. It’s true that scientists, scholars, and all people with post-secondary education are more likely than the general population to lean left; that’s well-documented. If the people whose job it is to know stuff are more likely to arrive at one set of conclusions than another, what does that tell you? They’re Liberals. Liberals opt to go into these fields of study, are educated by other liberals, using curriculum overwhelmingly based on the work of liberals, before going into workplaces surrounded by even more liberals. The people whose job it is to “know stuff” are afflicted with both confirmation bias and group-think. You would have the same problem if the journalism was dominated by conservatives. Liberals like Stephen Colbert are well-known for their liberal bias. 1) Nobody said science is perfect. It remains the best game in town for understanding what’s going on in the universe. It’s given us the technology through which we are presently communicating, among other things. Have you got something better? 2) I’d absolutely agree that media and academia are afflicted by group-think. I have spoken and written about that problem many times; it is the premise of the podcast episode that you are commenting on. 3) I think you’re engaging in chicken-and-egg obfuscation. The question for you remains: Why is the pursuit of knowledge so strongly correlated with what you are describing as liberalism? Conversely, why is religious fundamentalism (the subject of this episode) so strongly correlated with poverty, cultural/geographic isolation and lack of access to education? Re: “Have you got something better?” Yeah. The media should be beating their drums about this more regularly, report scientific news with much more skepticism than they currently do, and the scientific profession should be shamed into cleaning up their act. 2) The media and academia don’t seem at all concerned about bias or group-think. For example, as much as NPR talks about the importance of staff diversity, they won’t even mention the topic. Why are we suppose to believe that gender, race, and ethnic diversity in the newsroom is important, but political/ideological diversity isn’t? 3) “pursuit of knowledge” is a loaded phrase Adam. More Republicans have some college or are college graduates than Democrats, and conservatives are far more likely to select “practical” majors that are less likely to lead to advanced degrees. More Democrats go onto grad school because they pursue majors in the liberal arts, which absent additional graduate training, provide far fewer career opportunities immediately on graduation. I have no idea why religious fundamentalism is so strongly correlated with poverty. Do you? Why is liberalism so highly correlated with fields of study that have such poor job prospects and low earning potential? So evolution is Fact now? Weird, Sarah just raised the theory to a new level. Last time I checked, the Scientific Method needed a hypothesis to be tested and retested to show it’s truth. Can’t test “where humans came” from multiple times (or even once) cause it only happened once and no Scientists where there. But ask even the basic journalistic skeptical questions about the Theory of Evolution and you will start to see it fall apart. I’m guessing it should be easy cause Sarah said Evolution is true. So no problem, right? I’m not sure that Sarah called evolution a “fact.” Rather, she said the broad scientific consensus on evolution is a fact. Also, evolutionary science has answers to all of the questions you pose about it here. Lastly, you seem to be using “theory” in the colloquial sense of the word, not the scientific sense. Poor Sarah … what in heaven’s name does her background or present day religious beliefs have to do with her job as a reporter for NPR? News organizations where a diversity of life experiences are represented tend to collectively do a better job. Oh don’t be silly. Better for who? In what areas? By whose yardstick? The notion that NPR editors tell her, “we’re glad you’re covering the story because your’re an evangelical”, is risible. When you come from a certain background, or live in a certain place, or have a certain professional experience, you bring specialized knowledge to your reporting. You also bring a set of contacts. I’ve been in many editorial meetings where we’re discussing sourcing, and somebody says, “I’ve got an old friend / cousin / camp counselor / whatever whom we could talk to.” I think the example that Sarah cites in this interview is pretty compelling. She got exclusive access to a private meeting between Trump and evangelical leaders because her background helped her gain the trust of an evangelical source. There are stories to be done in neighborhoods where I, as a white dude, might have trouble gaining trust and getting people to talk. There are stories where the opposite is true. What makes you so skeptical of this notion? Seems pretty basic to me. Because I think you were trying to turn Sarah into an evangelical circus act. With grace and candor she came out on top. 1) That is a totally different argument from the one you started out making. 2) The notion that Sarah “came out on top” suggests that we were in some way working in opposition to each other, which is untrue. This is a topic she wanted to talk about, and something she has written about before. 3) I don’t think I was trying to play up the alienness of Sarah’s experience to my own; rather I was being honest about it. If it seemed from the conversation that my lack of direct life experience with religion and evangelical Christianity in particular has resulted in me having a somewhat one-dimensional view of evangelicals, then that further proves my point that news organizations are stronger when they are staffed by people of diverse backgrounds.